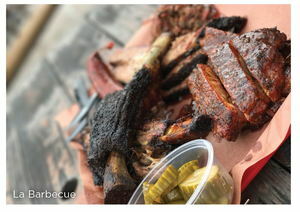 One of the first things I noticed when I moved to Austin, Texas was how the entire city smelled of barbecue. I knew I had found home. When attending the 2017 ACP Annual Congress this November in Austin, you’ll definitely want to sample some of the best barbecue Texas has to offer. While it has always had a solid foundation in smoked meats, Austin has seen an explosion of excellent barbecue in the last few years, making it difficult to pick a favorite. If there was time, I would say try them all. This place has collected so many awards, been voted in nearly every “best of” and created an industry around waiting in line for the day’s meat. It’s all warranted. It is so ridiculously good that once you walk in you immediately forget the four hours you just spent waiting in a hot parking lot. Everything here is delicious, but the brisket is the star. It’s so perfectly smoked that it stands on its own and really needs no additional sauce. If you feel like you need some, Aaron Franklin and his wife have developed an espresso barbecue sauce that at first didn’t make sense, but once applied, pairs perfectly. The bittersweet espresso somehow amplifies the smokiness and char of the meat. In a conversation with his wife, I found out they spent a very long time concocting it before they got it right, and they definitely got it right. This is easily some of the best brisket and pulled pork I’ve ever eaten. Unfortunately, I don’t usually have the 3–4 hours it takes to wait in line. You can try to go later in the afternoon, like at 12:30 or 1:00 p.m., but you’re likely to only get brisket, since everyone else has scarfed up the ribs, pulled pork, turkey and sausage. It can be worth the gamble, though, just for that sweet, sweet brisket. Like England, Austin maintains a monarchy–or more accurately, a meat-archy. At its head is the mad king–John Mueller, a mercurial pitmaster, who, due to his volatile nature, has pissed off most of the Austin barbecue scene, including his family. His sister now runs La Barbecue, and smoking meat is apparently genetic. If you can’t make it to Franklin Barbecue (Aaron Franklin incidentally started as a pitmaster for John Mueller), there’s a shorter line at this food truck off Cesar Chavez. There’s also a bar in the same park, which makes the wait more bearable. The brisket, pulled pork and sausage can be described with any number of superlative adjectives. It’s the beef ribs, though, that you want to get here, and there isn’t an adjective that adequately describes what they do with these. This place doesn’t get as much attention as it should, but has recently added a pitmaster from La Barbecue, which makes this dark horse one of my favorites. Everything is great, especially the pork ribs. 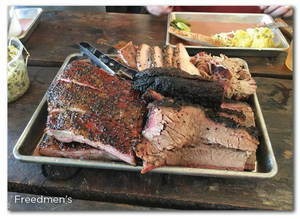 The brisket, pulled pork and sausage are all solid too. What makes this place shoot to the top of my list is the wait, or lack thereof. Because of the other stars around, and the location off the UT campus, you can get a table here pretty much anytime. If you come after lunch, you’ll have the whole place to yourself. Also, get the pork ribs. Did I mention the pork ribs? 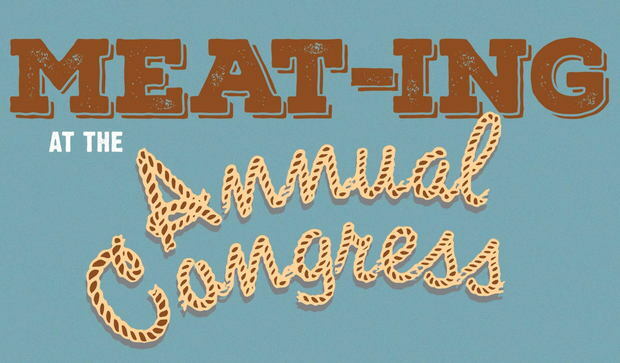 This is the closest barbecue to ACP’s Annual Conference—it’s in the same building. If you want solid barbecue, but don’t want to get too far from where you’ll be taking a nap directly afterwards, this is your place. The brisket is smoked well, the sausage is spicy and the pulled pork makes a great sandwich. Other noteworthy places to check out: Lambert’s, Terry Black’s and Micklethwait Craft Meats. If you have the time, head out to Dripping Springs for the legendary Salt Lick. Just make sure to bring a cooler of beer—they’re in a dry county. Lastly, here are a few tips for getting the most of your Austin barbecue experience no matter where you go. Get the fatty/moist brisket. You’re having barbecue, so your diet is shot anyway. You might as well get the best tasting cut of meat. Orders are by the pound, so if you’re ordering multiple meats just get ¼ pound of each. They add up quickly, and you don’t want the meat sweats. You will be asked if you want white bread, say yes. Combine with pickles, and you have the best pulled pork, chopped beef or brisket sandwich you’re ever going to have. You’re in Texas, so you have to wash it all down with some sweet tea, or the official drink of Austin, Topo Chico. And, for dessert, make sure to get the banana pudding with Nilla wafers—the perfect ending to a glorious meal.